I’m generally not one for cookie substitutions. If I want a cookie, I want a cookie. I want it to have butter and sugar and maybe some fun add-ins. But sometimes the experimental bug gets in my britches and I have to try something new. For these guys, which ended up being very close to an energy bar in cookie form, I used zero butter. That was extremely hard for me to do, but I managed to not sneak even a small pad of butter into the cookie dough. I know. It sounds crazy, but these Energy Cookies turned out pretty good actually. 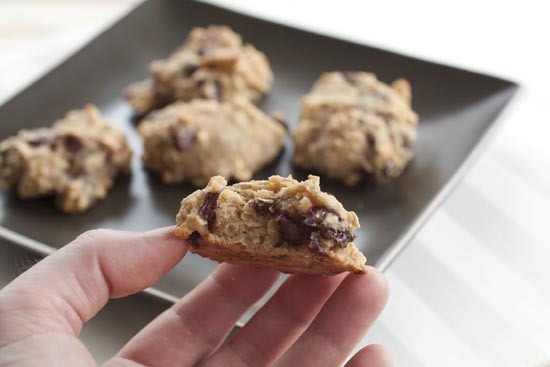 Super healthy energy bars baked up in delicious cookie form. 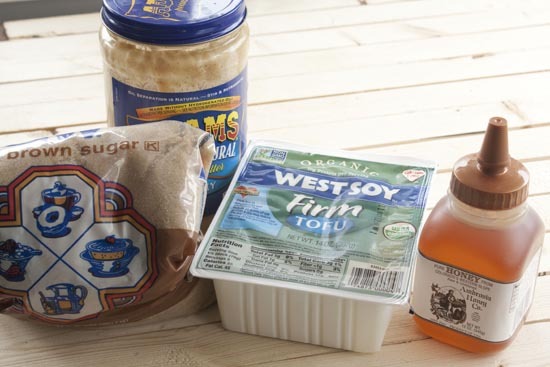 Instead of butter, you can use tofu to make cookies! 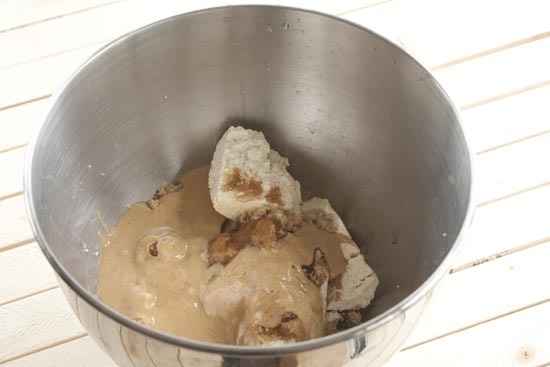 1) Drain tofu and add it to a mixer bowl with peanut butter, brown sugar, and honey. Beat on medium speed for 4-5 minutes until the ingredients are mixed well. 2) Add in eggs, one at a time, vanilla, and baking powder, and salt. 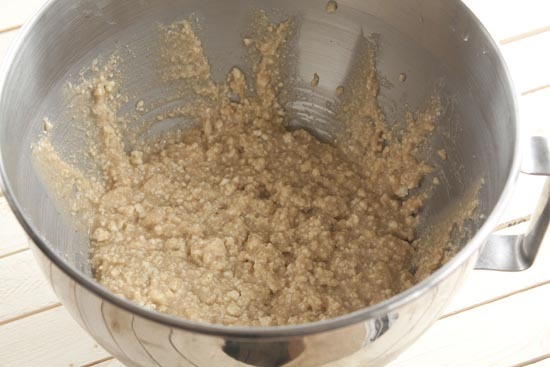 Then mix in flour and rolled oats in one-cup amounts. 3) Mix until dough just comes together. 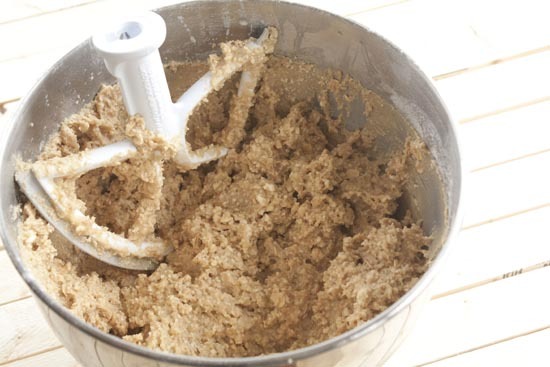 Try not to over mix the cookie dough. Stir in chocolate chips and dried cranberries at the very end. 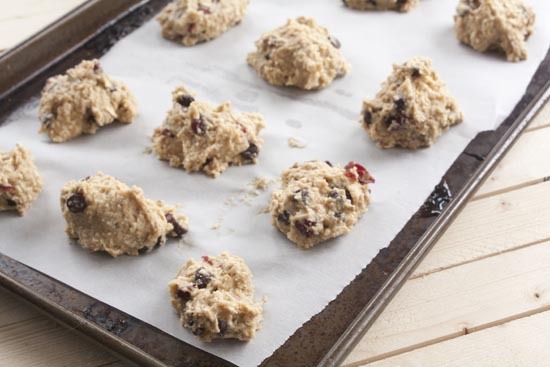 4) Line baking sheets with parchment paper and scoop out heaping tablespoons of dough onto the sheets. Just leave about an inch in between cookies. They won’t expand like normal cookies. 5) Bake the cookies for 12 minutes at 350 degrees. Finished cookies should be lightly browned on top and not gooey to the touch. 6) Let them cool for 5-10 minutes before eating and store extras in a plastic bag. Normal cookie recipes have a ton of butter and sugar which I love. Since I was trying to make an energy version though, I wanted to sub the sugar for some more natural flavors. I kept a small amount of brown sugar, but then used honey for the rest and also added in some peanut butter for extra flavor. Tofu instead of butter… scary. But I continued on with reckless abandon and turned my mixer on medium and beat the crap out of the tofu. 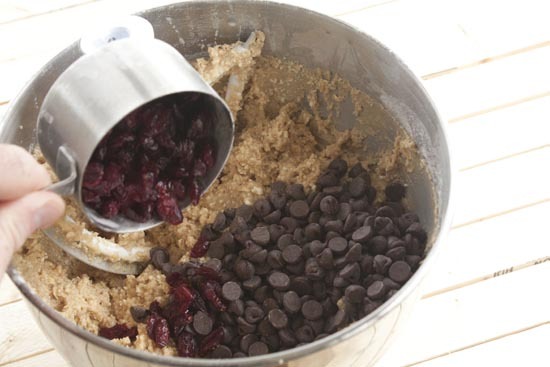 If you don’t have a stand mixer, you can definitely use a hand mixer for this recipe. The only tofu I could find, unfortunately, was firm tofu which never really smoothed out in my dough. You should use silken or soft tofu if you can find it. When I looked down at this in my bowl, I was pretty sure I was destined to write a failure post for this recipe. But again, I just moved ahead. I added in my eggs, vanilla, baking powder, and salt. Then I added in the flour and oats. What I was left with actually looked like cookie dough! It tasted decent also. Actually kind of looks like cookie dough. With my confidence back up, I stirred in some dried cranberries and chocolate. You could use any add-ins you want obviously. Nuts would be good. Good add-ins. Nuts would work also. I wasn’t exactly sure how these guys were going to bake up, but there’s only one way to find that out right? 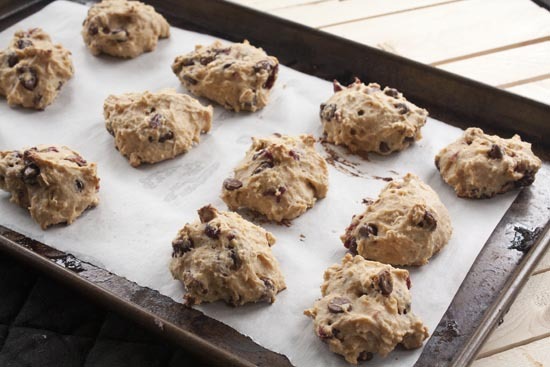 I scooped out large, heaping tablespoons of dough onto a few baking sheets lined with parchment paper. I baked the cookies for about 12 minutes at 350 degrees. When I took them out, they looked basically the same as when I put them in! I think this is because tofu doesn’t really melt like butter would so they stay more in shape. Once they cooled for a few minutes, I tried out my first bite! These were definitely closer to an energy bar in texture than a cookie. They were chewy, but light. Kind of a strange texture for a cookie, honestly, but the flavors were great! 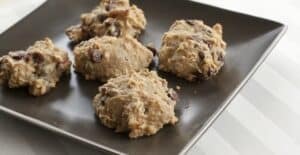 If you wanted to make these Energy Cookies even healthier, you could add in some other things like flax or substitute whole wheat flour maybe? I thought they turned out pretty decent though for a crazy cookie experiment. Energy and healthy? When I think of energy I think of Hudson Bay Bread, which is in no way, shape, or form to be considered healthy to be eating on a regular basis. I’d link a recipe but I can’t find one that resembles what I remember eating in the BWCA. A lot of recipes suggest smearing peanut butter on top, but ours had peanuts or peanut butter in them. Now I need to reconnect with the guy who made them and get his recipe. I’d be curious to see that recipe if you can dig it up. I made these with the silken tofu and found it definitely made them easier to mix and the cookies did flatten out a bit more. I subbed in dried blueberries for the cranberries which was delicious, but I do agree that nuts would be a welcome addition. Also, I think for my next round, I’m going to add a bit more oats which may just be my personal taste. Really pleased with the outcome on these – like your baked peaches recipe, I think this is going to be an AMAZING contribution to my morning breakfast routine. Thanks! Very happy to have stumbled upon this recipe (and website) on my quest for tofu cookie recipes! I used almond butter in place of peanut. I added a little more oatmeal and some wheat germ (to firm the dough up a bit, mine was a little runny…)these are awesome!